We love cookies at Plum Deluxe. From Rosewater Shortbread Cookies to Dark Chocolate & Sour Cherry Scone Cookies, they are all welcome guests at our tea table. 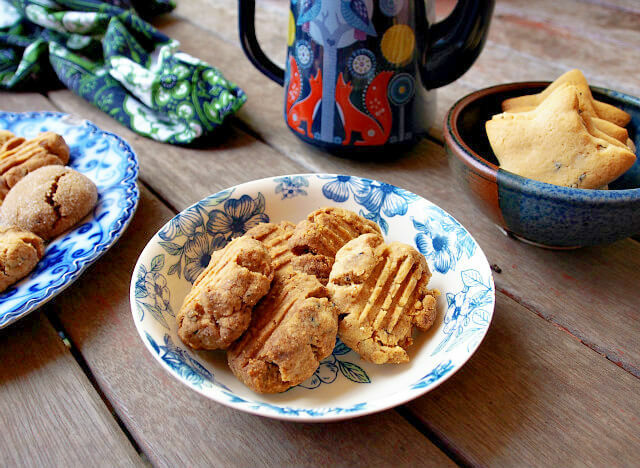 We’ve even had cookies made with tea before, like our luscious Melt-In-Your-Mouth Earl Grey Butter Cookies that are perfect served with a big cup of strong black tea. Today we’re serving up three new versions of cookies made with tea that are sure to delight all the senses — from the start of the baking process to that first bite into sweet, baked goodness. Soft molasses cookies made with tea are pure comfort, conjuring up feelings of Christmas and holidays and everything spicy. 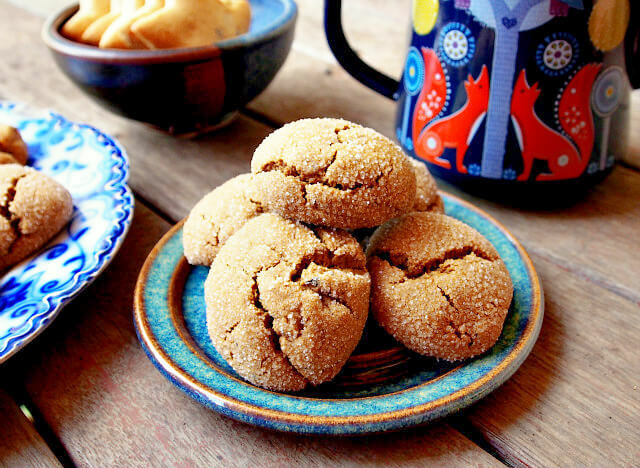 These ones are made with our Comfort Blend Black Tea with its notes of cinnamon and orange that pair so beautifully with the abundance of spices featured in the cookies. 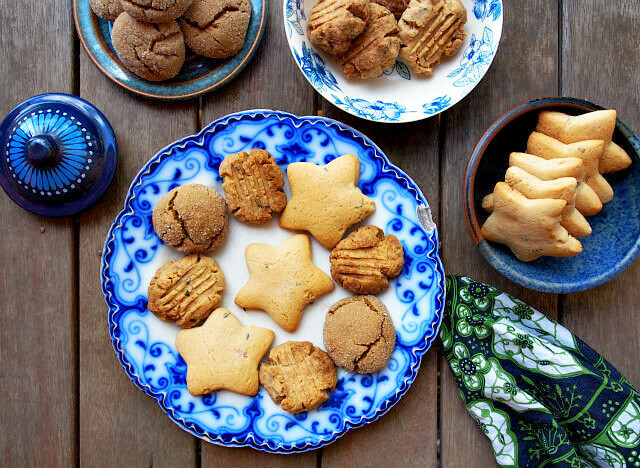 Cardamom, nutmeg, clove, cinnamon, and ginger are divine mingled with thick molasses and dark brown sugar, and the tea ensures the cookies stay moist and fresh for days after they are baked. They can be baked simply as they are, but I prefer them rolled in glistening white sugar so they sparkle wonderfully after baking and provide a great crunch that leads to the soft, spiced dough inside. You can serve them with a cup of the Comfort Blend Black Tea they’re flavored with, or just highlight one spice with our Spice of Life hot cinnamon spice black tea. Place tea leaves in heatproof bowl or cup and cover with just-boiled water. Set aside. Stir together flour, baking soda, ginger, cinnamon, cloves, nutmeg, cardamom, and salt until combined. Set aside. In a large bowl, beat together butter and brown sugar until smooth and creamy. Strain tea leaves, squeezing leaves to get as much flavor as possible. Add to butter mixture with molasses, egg, and vanilla extract and beat well until smooth. Add dry ingredients, a spoonful at a time, mixing until no flour is visible. Cover bowl with plastic wrap and chill at least 1 hour. Scoop cookie dough by teaspoon, rolling each piece into a ball, then roll in sugar and set on parchment-lined baking sheet 2-3 inches apart. Bake 10-12 minutes until tops begin to crack. Remove baking sheets from oven and let sit 5 minutes before removing to cooling rack. 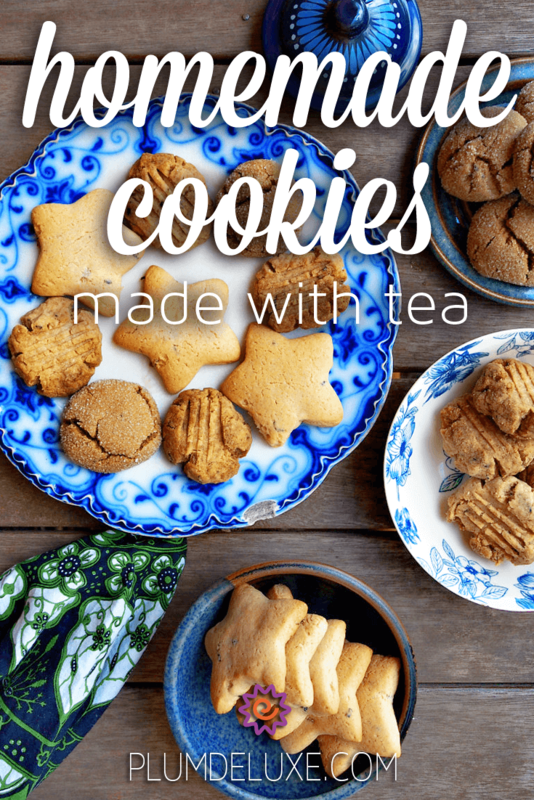 Sweet milk cookies made with tea are a charming twist on the traditional sugar cookie, made with a satiny sweetened condensed milk that gives them a chewy consistency. These beauties are made with our Brunch In Paris black tea blend; the chocolate and orange notes go splendidly with the orange extract that supplements the dough. This recipe is perfect for rolled cookies cut into your favorite shapes. Stars are always fun, but hearts, teddy bears, or simple circles work just as well. I like to stir in the tea leaves with this dough, as I like the look of the flecks throughout the cookies. If you prefer a smoother cookie, leave them out and let the extra strong tea do a fine job of giving both flavor and fragrance to the recipe. These sweet milk cookies go nicely with our Chocolate Hazelnut herbal tea since it echoes the chocolate notes found in the Brunch In Paris blend. Place tea leaves in heatproof bowl or cup, and cover with just-boiled water. Set aside. Stir together sugar, baking soda, cream of tartar, cinnamon, salt, and flour in medium mixing bowl. Set aside. Strain tea leaves, squeezing leaves to get as much flavor as possible. In medium bowl, whisk together tea, egg, butter, and sweetened condensed milk. Add to flour mixture and mix well until no flour remains. Roll out dough to 1/2 inch thick, cut into shapes, and set on parchment-lined baking sheets. 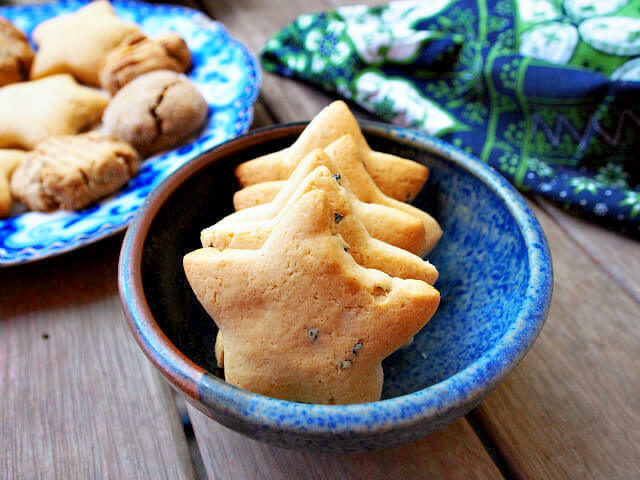 The final cookies made with tea are these simple shortbreads made with melted butter and flavored delicately with our Abundance Blend green tea. The elderflower and passionfruit additions are just the things to transform this simple cookie into something special. These cookies are best paired with a lighter tea that doesn’t overwhelm the unobtrusive flavors. Our Vanilla Sugar Cookie herbal dessert tea is a lovely choice. Mix together melted butter and vanilla extract. Set aside. Stir together flour and sugar in mixing bowl. Set aside. Strain tea leaves, squeezing mixture to get as much flavor as possible. Stir tea into melted butter mixture and add to flour mixture, mixing well until no dry flour is visible. Scoop up spoonfuls of dough and roll into balls. Place on parchment-lined baking sheet about an inch apart, and press gently with tines of a fork.